The wait is over!! Be sure to pick up your copy of Daredevil Blood of the Tarantula today, kids!! 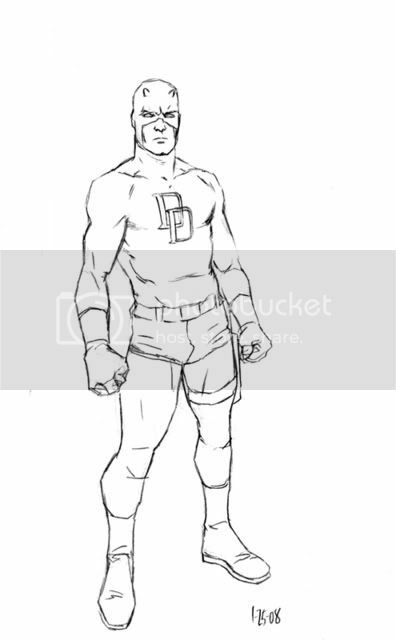 Daredevil Week is catchin' fire on the internets!! Here's a link to a Phil Hester and Ande Parks interview where they try to make me blush (it worked). P.S. I'm havin' a hard time posting images right now but I'll try again later today... thanks folks. 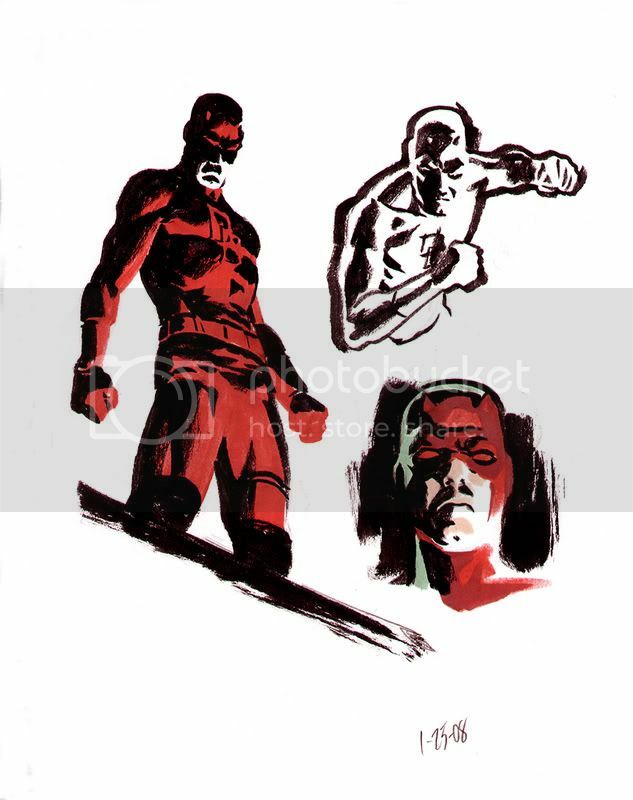 So today is one of my first sketchbook pages trying to get the hang of drawing Daredevil. Sure I've drawn ol' Hornhead plenty of time before but I felt I needed to find my own interpretation and make a "model sheet" of sorts before getting to work on the issue. 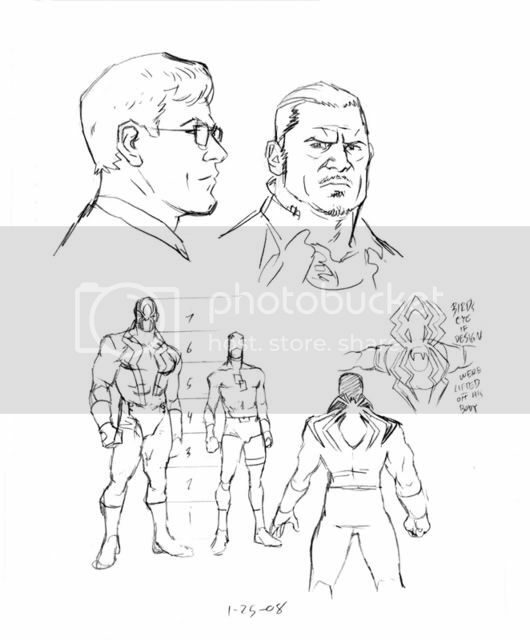 Up now at Newsarama are the Marvel previews for 4/30/08, which include the first six pages of DAREDEVIL: BLOOD OF THE TARANTULA ONE-SHOT. Go check 'em out!! Since I'm having difficulty posting images today, I just wanted to remind you folks I'll be out at the Oconocon on Sunday, May 4 in Oconomowoc, WI peddlin' comics and sketches so be sure to come by and say Hi! Also I'm extending the same offer for this show as I did with Planet Comicon, if you plan on getting a sketch drop me a line here (my email address is in my profile) and get yourself on the list early and I can have your sketch ready when I get to the show! Con sketches are B&W on 9x12 bristol board $40 for one character and $60 for two. Thanks everybody. Hope to see ya there! Aaand here's the finished piece. I added lots of little details added as I was inking... but that's what make it the "fun part"! Not terribly familiar with this guy... I think he was a clone maybe? After struggling to try to get these two together in Photoshop (since they are meant to be companion pieces to one another) I decided to just post them next to each other here on the ol' blog... which was no easy chore either by the way. One of these days I'll figure out computers. One of these days. (EDIT) A big big thanks to Jason Gavin for using his own free time to smoosh these two pieces together for me. Behold, the hardest helmet to draw EVER! So many little details and junk... and apparently Kirby drew them different nearly every time he showed up in the Fantastic Four. Still quite a bit o' fun. Here's Jesse and Tulip from Preacher. This was actually part of a Preacher sketchbook theme for the show. Check out Simon's Comicartfan gallery for the rest. I just got the Showcase Presents: Phantom Stranger vol. 2 in the mail last week and figured, after really falling in love with Bill Draut's work in this volume, I'd see if I could get some of the feel of his beautiful linework with a few of my brush pens. Not entirely successful, but a fun little experiment if nothin' else. Hey folks. Sorry for the lack of posts of late, I've been re-evaluating a lot of things lately, mostly my career in comics. I just don't have the passion I once had for the medium. Maybe I'll try my hand at something else for a while... I dunno. I think maybe I'll go back to bar tending school and finish my degree in mix-ology. Alright, alright. We've had a bit of fun. Now I guess I'll put the ol' kibosh on this scam. After thinking long and hard I honestly don't think I'm any good at anything besides comics and as far as my mix-ology goes I usually manage to get the cap off my beer on the first try, so... April Fools, dig?!! What? I can't do somethin' a little different for post 350? "Hmm" indeed... I wonder if I should start numbering these instead of wasting time trying to come up with a clever title. Check back tomorrow to find out, kids!